Jesus came not to be served, but to serve, so as followers of Christ, we aspire to serve each other and our community well. Indeed, service is one of Church at the Well’s core values. Looking back on 2018, we have had the opportunity to serve our larger community in a variety of capacities, and we are excited for the plans and possibilities for 2019! 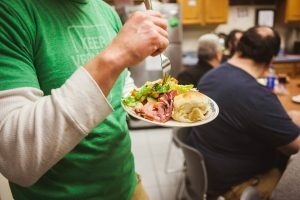 Last January, a number of us gathered at New Moon Café’s monthly Banquet to set tables and serve a sit-down meal to those struggling with homeless. Some of us got a chance to join the guests for food and conversation, learning more about life on the margins and sometimes discovering surprising and wonderful commonalities—a shared love for music, for instance. 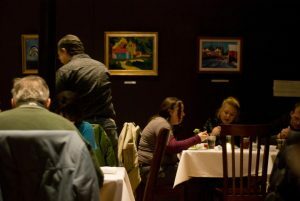 The banquet is special because it’s not just any meal, but an extravagant meal served in a beautiful atmosphere reflecting the inherent worth and dignity of the guests. While you can help out with the Banquet on the second Saturday of any given month, this March, we will be gathering a Church at the Well contingent to lend a hand, and we hope you’ll join us! Last March, Kevin Pounds spoke to us about the work of ANEW Place, sharing that he got started serving the homeless population simply by preparing a meal each month. We followed suit, and on a chilly Sunday evening in March, eleven of us gathered at Nate and Allison Palmer’s house to prepare a scrumptious seasonal meal under the direction of Jeff Bickford. It featured braised chicken, roasted root vegetables, and made-from-scratch cookies, and we got to enjoy the meal alongside the guests. The camaraderie that evening was so special that ANEW’s outreach coordinator recently said that ANEW guests still talk about that meal. The greatest need of people struggling with homelessness, Kevin said, is “people filled with God’s love who believe they matter.” This February, we are scheduled to prepare three dinners for ANEW Place (Feb. 1st– 3rd). That’s a lot of cooking! We’re hoping for many from the Church at the Well family to come out not only to help feed our brothers and sisters, but to let them know that they matter. Would you consider joining us? 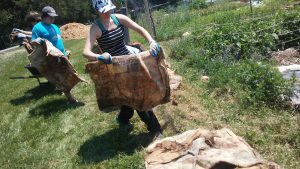 July 15thwas a scorcher, but that didn’t stop fifteen folks from Church at the Well from putting their hands in the dirt! We gathered at Rock Point for a picnic and some gardening. 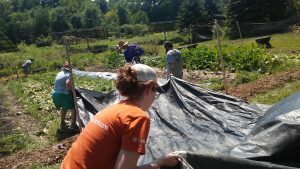 Our plan: to help rehabilitate community garden plots used to grow food for the Food Bank. A highlight of our time was making great connections with our project supervisors from Burlington’s Parks and Recreation Department. “One of my favorite moments was when we were introducing our church group to the Burlington Parks coordinators,” Allison Palmer noted. “I believe it’s so valuable for Christians not just to serve the community, but to introduce the church to those whom we serve.” It turns out we had a lot in common with one of our supervisors in particular, who had recently graduated from a Jesuit college with a major in religion and environmental studies. And he had a lot of questions for us about our church and our commitment both to service and caring for God’s creation. “It seemed like he really felt a connection to our purpose for being there,” Allison added. At Church at the Well, we value God’s creative masterpiece, the earth, and gardening at Rock was a way to serve people and honor the earth at the same time. In 2019, we hope to do more of just that! Specifically, this spring we’ll be coming alongside our Vermont neighbors in a longtime Vermont tradition: Green Up Day. And come summer, we’re trusting the Burlington Parks and Recreation Department will have another meaningful project that will give us a chance to serve our larger community while getting our hands dirty. “God has blessed me with so many blessings, and I feel he wants me to give and to help others as much as I can,” said Patty, reflecting on serving at Rock Point. Pray with us and join us as we roll up our sleeves in 2019. Contact Abby@wellchurchvt.comwith questions, or with ideas for service projects.